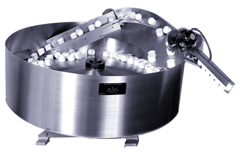 Centrifugal parts feeders are used in high-speed feeding applications or in applications that prohibit vibration. A cone-shaped disc is rotated inside a bowl. Parts placed inside are moved in a circular direction and centrifugal force moves the parts toward the perimeter of the disc. Optional air drives are available for hazardous locations.